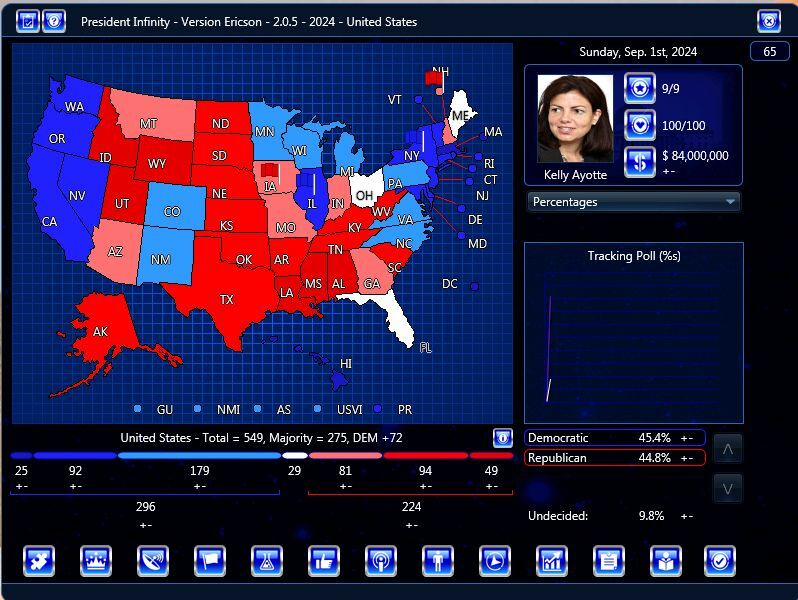 Short Background: This is a follow up scenario to Sentinel’s 2020 election. In 2020, Vice President Joaquin Castro loses the general election to New Hampshire Senator Kelly Ayotte. President Ayotte’s first term is both surprisingly moderate and controversial. Can she win four more years? Please note that this scenario is still in beta. There is a lot to do still. That said, please post your election results! In 2020, President Hillary Clinton decided to forgo a run for a second term as President. Amongst a well-contested and divided field, Vice President Joaquin Castro narrowly squeaks out a victory against Senator Kirsten Gillibrand of New York for the Democratic nomination. With rumor of an economic downturn underway, Castro, in a surprise move, selects former Treasury Secretary Jack Lew as his running mate. On the Republican side, New Hampshire Senator Kelly Ayotte pulls away from the rest of the pack and secures the GOP nomination. Ayotte selects former Governor Brian Sandoval of Nevada as her running mate. Businessmen Jeff Bezos and Donald Trump both contemplated independent runs for the White House but ultimately decided against it. Facing strong headwinds for change and rumors of economic downturn, Ayotte/Sandoval defeats Castro/Lew with 289 to 256 Electoral Votes, and 53% of the popular vote to 46%. President Ayotte has had a rocky start to her Presidency. Vice President Sandoval quickly becomes embroiled in a campaign finance scandal and resigns within the first year of the Ayotte Presidency. In a surprise move picks former Central Intelligence Director George John Tenent. While there is some skepticism about his appointment, he is ultimately confirmed by the Republican Congress. Ayotte received flak from the right of her party when she vetoed the repeal of the Affordable Care Act. In addition Ayotte would be credited with the passage of law that gave US territories one electoral vote. By the time the 2022 Midterms come around, Ayotte is being attacked on two fronts – grassroots activism against her Administration’s policies which have barely gotten through the Republican Congress and rumors that she may fall next in the Sandoval Campaign Finance Scandal. Fortunately for the President the latter remains just a rumor, but that doesn’t stop Republicans from losing both the House and Senate. In mid-2023, United States forces at Guantanamo Bay are attacked after the Cuban government falls after the death of Raoul Castro. Sensing an opportunity, Ayotte sends troops into Cuba without Congressional approval using the War Powers Act. The debate rages in Congress as American forces begin to occupy Cuba. With the economy doing moderately well, can Ayotte win a second term after a controversial first term?